Temperature is simply defined as the measure of heat which is present in a substance. A thermometer is used to measure temperature which is expressed in degree Celsius or Farenheit. We will be using Celsius in the course of this article. In an aquarium setting, temperature is an essential factor that should be considered to ensure the comfort and well-being of your fish. In order to maintain stability of water temperature at a specific range, an aquarium heater should be installed particularly in regions where extremes in environmental temperature take place during the different seasons of the year. Aquatic animals are ectothermic, a term which is derived from the Greek words “ektos” (outside) and “thermos” (hot). Ectotherms are unable to regulate their body temperature thus their body temperature is mainly influenced by the temperature of their surroundings. Ectotherms are also called “cold-blooded” animals. Fishes usually have body temperatures which are within 1oC – 2oC of their environment. The process by which fishes and other ectotherms are influenced by their surrounding can be demonstrated using two objects of different temperatures which are placed together. Bringing them together causes heat to pass from the warmer object to the cooler one until they are of the same temperature. The two objects in this illustration are fish and water. Water temperature changes at a very slow rate because it is highly resistant to changes in environmental temperature brought about by it high specific heat. Land dwellers including people and warm-blooded animals usually experience a 15°C fluctuation in the daily temperature as a result of heat from the sun. On the other hand, variation in temperature of aquatic environments average between 3 - 4°C only. In an attempt to thrive well in their habitat, various species of fish have successfully adapted to a broad range of temperature. A species of fish in a particular environment endeavors to acclimatize themselves within a relatively restricted temperature range. Whenever the temperature dips or increases outside this narrow range, the fish will eventually become stressed and the effect can be manifested as a change in metabolic rate, abnormal function of the respiratory system, imbalanced osmoregulation and blood pH alteration. According to Rastogi (1997), metabolism is the total of all chemical reactions occurring within a cell and a living organism and these reactions can be broadly separated into two categories: anabolism and catabolism. Anabolism is the “building-up” process wherein molecules are synthesized into larger components such as carbohydrates, proteins, and lipids. On the other hand, catabolism involves “breaking down” of nutrient molecules into simpler products such as H20, CO2, and ammonia. In anabolism, free energy is required to be stored as potential energy while catabolism converts potential energy into chemical energy. Both anabolism and catabolism are carried out by specific enzymes that require optimum temperature and pH in order for the processes to be carried out efficiently by the body. At low temperature, the enzymes become inactive while extremely high temperatures can render the enzyme specific for protein metabolism ineffective. When the metabolic processes in an organism’s body cease to function normally, this can have negative repercussions and eventually death may occur. At high temperature, the dissolved O2 and CO2 levels in water quickly evaporates as gas into the atmosphere. Without an aquarium aerator, the fishes compensate for the decrease of dissolved O2 levels by increasing their respiratory rate in an effort to absorb more O2 through their gills. This compensatory mechanism will trigger an increase in the release of the stress enzyme, adrenaline, and a subsequent increase in heart rate. When these conditions exist for a considerable period of time, the immune system will be compromised thereby increasing the chances of disease outbreak. These conditions will eventually lead to hypoxia particularly when the temperature is not immediately corrected. When there is a low level of oxygen dissolved in aquarium water, the environment can become hostile for your fish. By adding a fish tank aerator to your aquarium, you will be able to bring in fresh oxygen into the aquarium water to supply the vital needs of the fish species. If you have live aquarium plants and they appear have poor growth, think of installing a good carbon dioxide tank. Using a CO2 tank in your aquarium can certainly spell the difference between having rich and vibrant foliage and aquarium plants that lack luster and vigor. 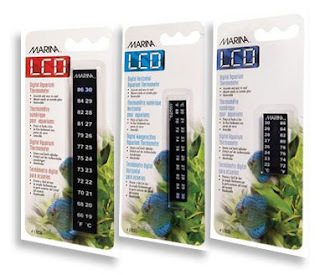 In order to fully enjoy your hobby, it is very important for an aquarist or hobbyist to be armed with valuable information regarding the ideal temperature for your chosen fish species and recognize the significance of investing in quality fish tank heaters with thermostats coupled with a reliable thermometer to ensure that temperature inside the tank is maintained at safe levels. Here at Just Aquatic online aquarium store, we carefully select a range of quality products for you to choose from! All heaters we stock come with thermostat. Indiviglio (2006, pg 19) recommends to install a second heater and it should be set to the lowest acceptable temperature for the fish of interest. In this way, there is a back up heater if the main heater fails. We think that this is a good idea. To be extra sure, always use a thermometer to record the temperature weekly! We hope this article is both informative and helpful. Look out for our next article, we will be discussing a very interesting hot topic which has everyone confused and puzzled over – Water hardness and salinity.